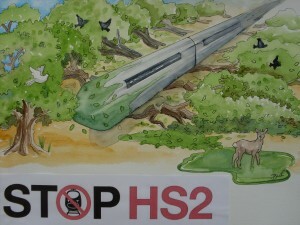 As HS2 Ltd prepare to publish a summary of responses to the HS2 Phase 1 Environmental Statement, under-secretary of state for transport, Robert Goodwill, has angered people affected by the project, claiming many will submit ‘vexatious petitions’ to ‘gum up’ the Hybrid Bill process, opposed to them feeling it is their only right of appeal after being ignored by HS2 Ltd for four years. Goodwill said he expected “Petitions for vexatious reasons to gum up the process.” whilst giving evidence to the House of Commons Environmental Audit Committee on Wednesday 26th March, saying that the “The big challenge [for the Hybrid Bill Committee] is to separate these petitions from the genuine types.” Goodwill had started the session saying that Government had has sought to reduce the environmental impacts as much as possible from the start of the project, a view not held by communities along the route and environmental campaign groups. As an example of the sketchiness of the HS2 Environmental Statement, Goodwill reiterated the official line, that HS2 Phase 1 will directly affect 19 ancient woodlands, despite the Woodland Trust putting this number at 27, with a further 22 at risk of secondary effects. In the latter stages of the session, Peter Miller of HS2 Ltd admitted that after four years of developing HS2 that their “ancient woodland directory might not have picked up all the sites”, and that “there are ancient woodlands which could have been surveyed, but haven’t ”. Despite the definition of ancient woodland being a wood which have been a constant for at least 400 years, Goodwill said that mitigation sites could establish themselves as ancient woodland within 10 years, which Meriden MP Caroline Spelman described as ‘optimistic’. Afterwards, Miller back-peddled, saying “I want to be absolutely clear, the ancient woodland loss is irreplaceable”. When Hendon MP Matthew Offord asked “If ancient woodland is irreplaceable, then why not tunnel?”, Goodwill responded: “That is irresponsible”.